Context: The Banks Board Bureau (BBB) has recommended 22 general managers to be elevated as executive directors at various public sector banks. 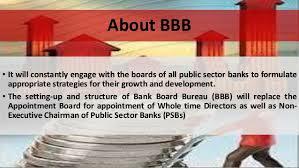 These recommendations are based on interactions held by the Banks Board Bureau with eligible candidates from PSBs towards appointment against vacancies in PSBs for the period 2018-19. The Appointments Committee of Cabinet headed by Prime Minister will take the final decision in this regard. There are already some vacancies at executive director level and more would be created during the course of the year. It was set up in February 2016 as an autonomous body– based on the recommendations of the RBI-appointed Nayak Committee. It was the part of Indradhanush Plan of government. Its broad agenda was to improve governance at state-owned lenders. Its mandate also involved advising the government on top-level bank appointments and assisting banks with capital-raising plans as well as strategies to deal with bad loans. For Prelims: Mandate, objectives and composition. For Mains: Indradhanush plan, recommendations of Nayak Committee. 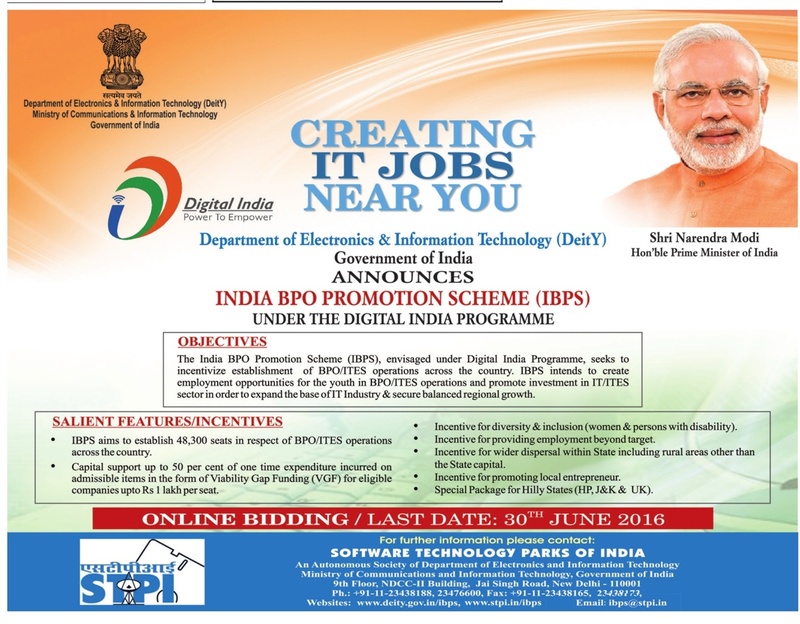 Context: The Union government is planning to expand its BPO promotion scheme under the Digital India initiative. The government has proposed to more than double the number of seats under the scheme. The India BPO Promotion Scheme (IBPS), envisaged under Digital India Programme, seeks to incentivize establishment of 48,300 seats in respect of BPO/ITES operations across the country. It is distributed among each State in proportion of State’s population with an outlay of Rs. 493 Crore. This would help in capacity building in smaller cities in terms of infra & manpower and would become basis for next wave of IT/ITES led growth. Financial Support: Up to 50% of expenditure incurred on BPO/ITES operations towards capital expenditure (CAPEX) and/or operational expenditure (OPEX) on admissible items, subject to an upper ceiling of Rs. 1 Lakh/Seat. Special incentives toward employment of women & specially enabled persons. Incentive for generating employment beyond target & wider dispersal within state including rural areas. Special consideration for Hilly states of HP, J&K and UK. This scheme has potential to create employment opportunities of around 1.5 lakh direct jobs considering three shift operations. It may also create good number of indirect jobs. BPO / ITES Industry is one of the fastest growing segments under the Information Technology sector in the country. It has immense potential to grow and expand further because of its readiness to deliver at par with global standards and inherent cost advantage. Currently, most revenue by this sector is generated from, in and around, the metropolitan areas of Bengaluru, Chennai, Delhi NCR, Hyderabad, Kolkata, Mumbai and Pune. Other parts of the country, having availability of talent pool and infrastructure, are yet to reap the benefits of this global boom. For Prelims: IBPS scheme- objectives and features. For Mains: BPO industry- development in the country, challenges and significance. Context: The Centre will set up the country’s biggest data centre in Bhopal with a capacity to host five lakh virtual servers. It will be set up by the National Informatics Centre (NIC), under the Ministry of Electronics and Information Technology (MeitY). NIC, under the Department of Information Technology of the Government of India, is a premier Science and Technology Organization, at the forefront of the active promotion and implementation of Information and Communication Technology(ICT) solutions in the government. The NIC is a part of the Indian Ministry of Electronics and Information Technology’s Department of Electronics & Information Technology. With the increased expectations from citizens for online services and the number of e-Governance Projects being launched by the Government, the Data Centre requirements are growing exponentially. There is a need to set up strategic infrastructure that facilitates high availability, quick scalability, efficient management & optimized utilization of resources. To fulfil this requirement, NIC has set up state-of-the-art National Data Centres to provide services to the Government at all levels. These Data Centres combine round-the-clock operations and management of systems with onsite skilled personnel. The National Data Centres host Government websites, services and apps. For Prelims: NIC and NDC- features and objectives. For Mains: ICT and its development in the country. Topic: Issues related to health. 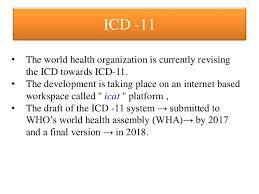 Context: The World Health Organization (WHO) has released its new International Classification of Diseases (ICD-11). The ICD is the global health information standard for mortality and morbidity statistics. ICD is increasingly used in clinical care and research to define diseases and study disease patterns, as well as manage health care, monitor outcomes and allocate resources. ICD has been translated into 43 languages. More than 100 countries use the system to report mortality data, a primary indicator of health status. This system helps to monitor death and disease rates worldwide and measure progress towards the Millennium Development Goals. About 70% of the world’s health expenditures (USD $ 3.5 billion) are allocated using ICD for reimbursement and resource allocation. ICD-11 identifies health trends and statistics worldwide, and contains around 55,000 unique codes for injuries, diseases and causes of death. ICD-11, which has been over a decade in the making, provides significant improvements on previous versions. Also for the first time, it is completely electronic and has a much more user-friendly format. And there has been unprecedented involvement of health care workers who have joined collaborative meetings and submitted proposals. The new ICD-11 also reflects progress in medicine and advances in scientific understanding. For example, the codes relating to antimicrobial resistance are more closely in line with the Global Antimicrobial Resistance Surveillance System (GLASS). ICD-11 is also able to better capture data regarding safety in health care, which means that unnecessary events that may harm health – such as unsafe workflows in hospitals can be identified and reduced. The new ICD also includes new chapters- one on traditional medicine and another new chapter on sexual health. The ICD is the foundation for the identification of health trends and statistics globally. It is the international standard for defining and reporting diseases and health conditions. It allows the world to compare and share health information using a common language. The first international classification edition, known as the International List of Causes of Death, was adopted by the International Statistical Institute in 1893. WHO was entrusted with the ICD at its creation in 1948. The ICD is revised periodically and is currently in its 10th revision. For Prelims and Mains: ICD- what is it, uses and significance. 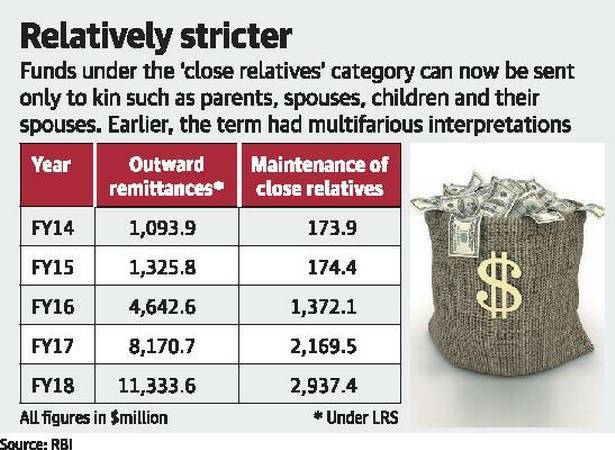 Context: Concerned over funds sent abroad under the ‘maintenance of close relative’ category of the Liberalised Remittance Scheme (LRS), the Reserve Bank of India (RBI) has narrowed the definition of relatives to check the flow of funds. RBI has aligned the definition of ‘relative’ with the definition given in Companies Act, 2013 instead of Companies Act, 1956. Hence, funds under the ‘maintenance of close relative’ category can be sent only to immediate relatives such as parents, spouses, children and their spouses. Outward remittances under maintenance of close relatives shot up to almost $3 billion in 2017-18 from a mere $174 million in 2013-14. In fact, funds sent under this category have more than doubled since 2015-16. Overall outward remittances under LRS went up to $11 billion from $1 billion in the same period. Under LRS, all resident individuals can freely remit $250,000 overseas every financial year for a permissible set of current or capital account transactions. Permitted: Remittances are permitted for overseas education, travel, medical treatment and purchase of shares and property, apart from maintenance of relatives living abroad, gifting and donations. Individuals can also open, maintain and hold foreign currency accounts with overseas banks for carrying out transactions. Not permitted: However, the rules do not allow remittances for trading on the foreign exchange markets, margin or margin calls to overseas exchanges and counterparties and the purchase of Foreign Currency Convertible Bonds issued by Indian companies abroad. Sending money to certain countries and entities is also barred. Under LRS, people can’t send money to countries identified as ‘non cooperative’ by the Financial Action Task Force. Remittances are also prohibited to entities identified as posing terrorist risks. For Prelims: Liberalised remittance scheme. For Mains: Need for control of foreign exchange movements. Context: Central Water Commission (CWC), India’s apex technical organization in the field of Water Resources, has entered into a Collaboration Agreement with Google for flood forecasting. This initiative is likely to help crisis management agencies to deal extreme hydrological events in a better manner. The collaborative arrangement is likely to result in saving of crore of rupees which otherwise would have to be spent by the government on acquiring high resolution DEM, high end computational resources and developing dissemination platforms widely used by the masses. 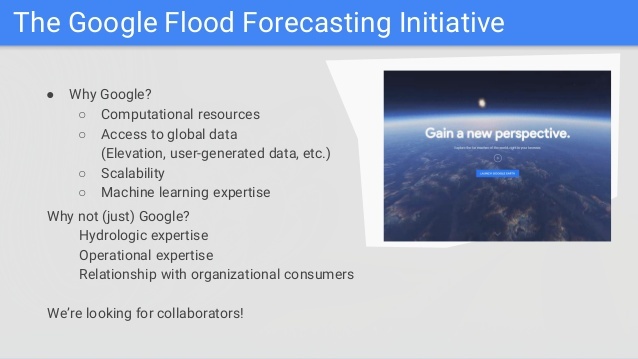 For Prelims: CWC, agreement between CWC and Google for flood forecasting. For Mains: Water crisis in India- causes, effects, challenges and solutions, flood management in the country. Topic: Challenges to internal security through communication networks, role of media and social networking sites in internal security challenges, basics of cyber security. WHAT is it? It is a mobile application developed by Telangana police for their internal communication purpose. It has been developed on the lines of WhatsApp. Police have developed this app keeping in view the safety of their information besides having hassle free communication. The app is a secure communication channel, with no limit on the number of members in any individual group (unlike the regular WhatsApp which has a restriction of 256 numbers) and has all the features of WhatsApp. Other features of the Cop-Connect app are chatting, group chats, file sharing (image, audio, video and documents) and location sharing. A unique feature, iMeeting, can help in creating and scheduling department meetings in an easy way. The app will help in connecting 60,000 plus police force, spanning over 31 revenue districts across the state. COP Connect’s has end-to-end encryption with server being with Police Department and it ensures absolute security and confidentiality of internal police communication. WHAT is it? To honour soldiers who have been disabled in line of duty, while serving the Nation and to celebrate the undying spirit of ‘Soldiering’, Indian Army is observing the year 2018 as the ‘Year of Disabled Soldiers in Line of Duty’. WHY? The primary focus is towards alleviating the sufferings of these soldiers, who have done their duty with utmost dedication to the Nation and have been disabled for the life. HOW? The endeavour this year is to provide a onetime financial assistance to disabled soldiers who have been boarded out from service on medical grounds and are rendered non-employable due to their medical or physical conditions.